This is one of my favourite ties that I’ve come up with so far… my husband loves it! 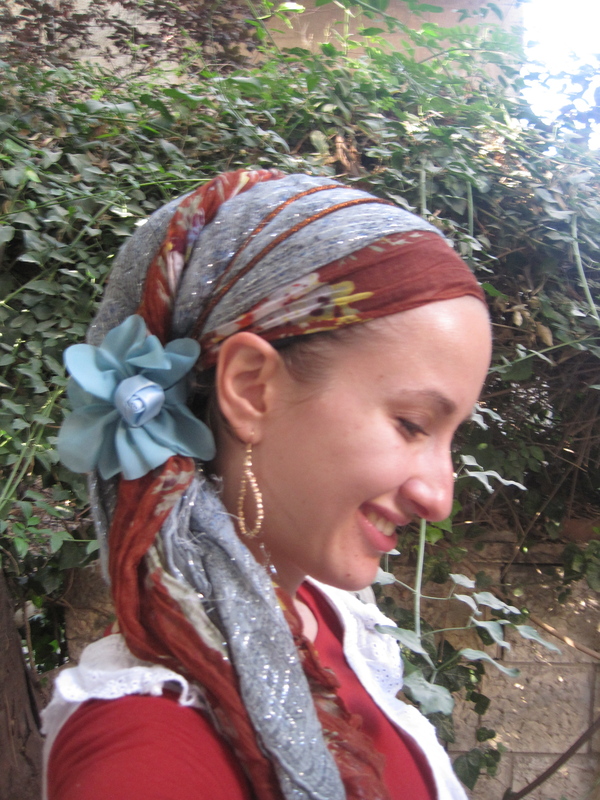 You will need one long scarf, one square one (I use a simple Israeli one), a stretchy headband and some sort of clip (I use a flower one, hence the name of the tie). Make sure that when you tie the long scarf that one end is longer than the other. Try washing them so they’re not as stiff? Mine are really soft so that makes it easier. Will do! they are all either light weight cotton, or silk type materials, so I wouldn’t think they would actually be too bulky , but honestly I’m stumped. I will wash a few tomorrow and give it another try! Hi my name is Adina.I started covering my hair with tichels only.I wana know what voluminizer is this?I love that its not too high and is low and flattering.